A prominent figure in the Yoruba community in Kano and a wealthy business mogul, Alhaji Ganiyu Akanbi has been murdered by some suspected assassins. Ganiyu Akanbi was murdered in the wee hours of today, Thursday, June 5th, 2014 at his mansion in Kano. 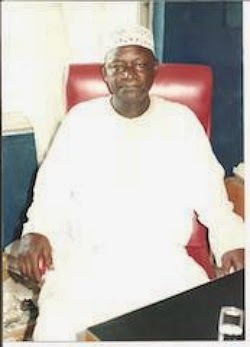 The 86-year-old devout Muslim is the owner of Criss Cross Oil and Criss Cross Hotel and the grand patron of the Yoruba community in Kano. According to family sources, Ganiyu was brutally stabbed to death at his home by unknown assassins on Thursday morning. Late Ganiyu hailed from Ibadan in Oyo State, “he considered Kano as his second home and was very popular within the Race Course area, where he was attacked and hacked to death by yet to be identified persons,” one of his aides told reporters. His death has thrown his immediate household and the entire Yoruba community into mourning. 5 employees of his new company, an hospitality center have been arrested by security operatives for investigation. He has since been buried in his residence on Race Course road, according to Muslim rites. May the soul of this elderly statesman Rest in Peace. Nr-1 employers and close people even amoung is family, they cant wait for is death to get thier share,so they have to assine him, since is 86yrs in good health,is not ready to go and live all he work for in is life for them to share,some children are heartless also, God dont give us Amen. It could be his business associates and also depend on how genuine his business is. Also it might have nothing to do with his employee.